Half my Leyburns are done. 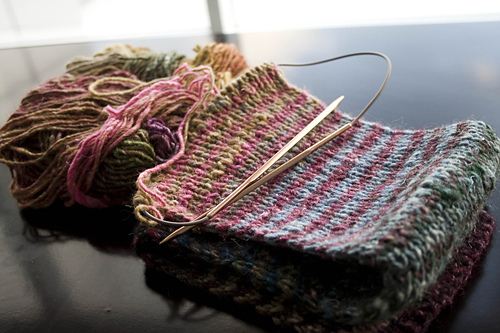 For some reason, I lost my groove and can only do about 2 to 3 pattern repeats of this sock at a time. I want to finish these before the big meet up on Friday. It fits my daughter and she is happy with it so I should really get on with it, shouldn’t I? The picot-edge cuff was sewn down following this tutorial. The bandwagon is as advertised. The Noro Striped Scarf is not just hype. It is the real deal. Knitting two rows of 1×1 ribbing alternating between two skeins of Noro Silk Garden Worsted with contrasting colourways is like crack. It’s so mindless that I knit it in the car at 5.50am when it’s still dark. I love this project. This is Christmas Gift 2009 No. 1, not sure who will be the lucky recipient yet. I’m about halfway through the 2 skeins I think. The stripes unfold before my eyes! Believe me I find it hard to concentrate on actual knitting. When I go on Ravelry I find it hard to tear myself away long enough to knit. The community is such that you could waste an entire day just going from forum to forum and fly through pattern after pattern. Okay then, back to the blog. I received this year’s first mailings of a couple of my yarn club subscriptions. The first one was a surprise as I completely forgot that it was coming. 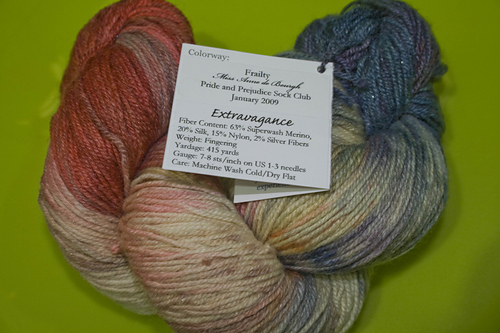 It’s the January mailing of the Pride and Prejudice Sock Yarn Club from Knit It Up! at Etsy. I received two generous skeins of hand-dyed sock yarn in a lovely superwash merino base with flecks of silver that shimmer so softly. What a grand old dame, huh? This colourway is a contrast of her bright red hair and the healthy girl she could have been with her pale skin, the dark shadows under her eyes and the sick girl she was. I didn’t have much to go on as she doesn’t speak one word in the book or the miniseries. Poor Anne, even with her wealth she never really stood a chance, did she? As I took the time to actually think about her, in my mind she came to represent the frail position of women in Jane Austen’s time: always dependent on father, husband or brother, and in Anne’s case, completely overpowered by her mother. 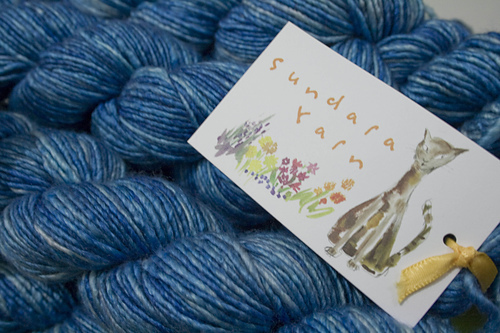 One of the most sought-after yarns are those excellently dyed by Sundara Murphy. She uses only the best yarn bases and the deepest, richest colours. Plus she calls the colourways with fun names! I was lucky enough to have beaten the rush and subscribed to three of her collection: Seasons, Sweater and Lace. 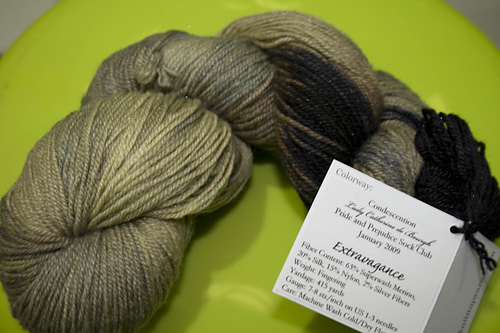 January was the first mailing of the Sweater Collection and it was in the fabulous Aran Silky Merino base. I have seven skeins of this fabulous yarn in the Marina Over Icicles colourway. I have been perusing through pattern after pattern for the perfect cardigan/vest/sweater for this luxuriously soft and shiny yarn. You can almost touch the silkiness! However the yarn club I am most excited about is the Rockin‘ Sock Club. I totally spoiled myself by looking at other knitter’s posts about the January shipment. I don’t care. I’m sure I will still be filled with excitement when the shipment arrives. Which is making me so anxious because I have no shipment confirmation yet! Imagine a bluesy colourway with a sock pattern including beads. Yeah.